The Beatles 50 Years Ago Today: February 5, 1967. Beatles Radio: The Beatles, Solos, Covers, Birthdays, News The Fab 4 and More! The Beatles began making the promo film for Penny Lane on this day. It was a two-day shoot, completed two days later. For this first day they were filmed in and around Angel Lane in Stratford, London. 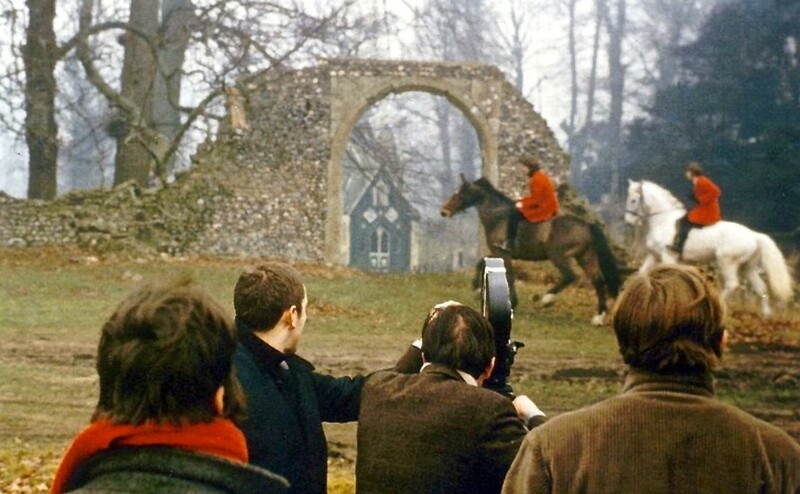 The Beatles rode horses and walked in the area between midday and 4pm. The cast, crew and The Beatles were based at the Salway Arms pub for the day when they weren't filming. Work was delayed by the late arrival of the red hunting jackets worn by the group; eventually a newspaper distributor named Ernie Smith drove to Commercial Road in Stepney to collect them. The Beatles rode white horses down Angel Lane and across a car park. Lennon was filmed walking alone on the street, and meeting the rest of the group by the Theatre Royal. Much of Angel Lane was redeveloped in the 1970s to make way for the Stratford Centre, and a new pedestrian area, The Mall, was built over the old street. Filming continued on the following day in Knole Park in Sevenoaks, Kent. Footage around the Penny Lane area of Liverpool was also filmed at an unknown date by director Peter Goldmann, without The Beatles' involvement.